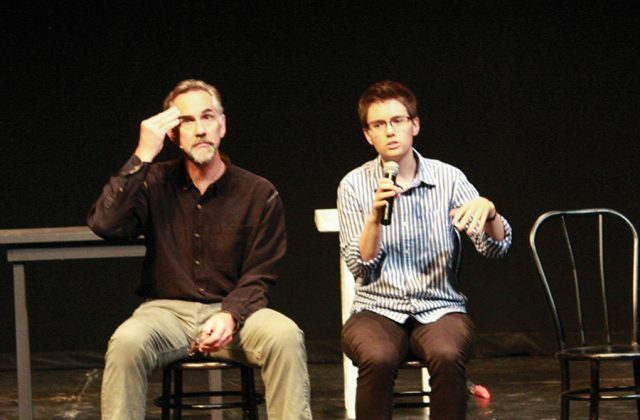 Ted & Company TheatreWorks is a group of storytellers who use theater and comedy to open up conversation about social justice issues and faith in an incredibly effective way. “Discovery: A Comic Lament” was performed by the producer, Ted Swartz, Goshen professor, Michele Milne and Goshen student, Abigail Greaser, who joined the cast for the weekend. “Discovery” was written by Alison Brookins and directed by Phil Weaver Stoesz. Additionally, the Dismantling the Doctrine of Discovery Coalition assisted in the making of the play to ensure that the play properly represented the impact that European imperialism had on Native Americans and how it continues to affect them today. The show began when it was announced that the land on which Goshen College was built was stolen from the Potawatomi tribe. The show opens with a satirical scene set in New Spain, “the year of our Lord, 1513.” Spaniards have just discovered the New World and they are giving the Natives an offer they believe to be irrefutable: the full citizenship package. The indigenous people of the land can either become citizens of Spain at the expense of their culture or go to war against the Spaniards. It’s a once in a lifetime opportunity the Natives won’t want to miss out on according to the conquerors. This exploitation of Native Americans continued as the focus throughout the play, displayed with just the right blend of humor and sensitivity. “Laughter invites us in” said Brookins. The play makes the audience feel comfortable at the beginning by making fun of European settlers and examining history with a satirical eye, then it brings its message home by connecting the audience with modern injustices. “Discovery” digs deeper by discussing The Dakota Access Pipeline and other tragedies affecting Native Americans today. Brookins said that she first became interested in Native American issues through making friends with Native Americans and building relationships with the communities. She observed their culture and listened to their struggles. During homecoming weekend, when all of Goshen College came together, students are often reminded of how culturally diverse Goshen College is. When one watches “Discovery” they realize just how much they don’t actually know, not just about Native American culture, but most cultures outside their own. The audience is forced to look deeper and try harder to understand other cultures’ struggles. Through this, “Discovery” fully embodies Goshen College’s culture for active learning and service. All anyone could talk about after the show was how powerful it was.